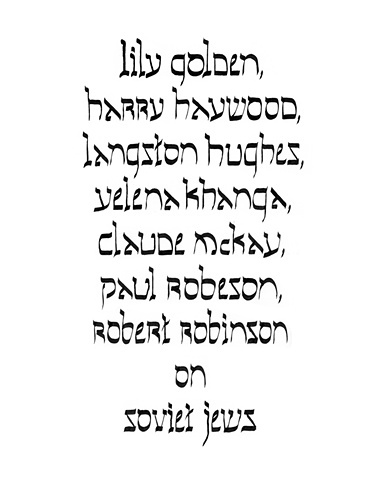 The project Lily Golden, Harry Haywood, Langston Hughes, Yelena Khanga, Claude McKay, Paul Robeson, Robert Robinson on Soviet Jews traces the history of the Jewish community in the Soviet Union between 1920s and 1980s via memoirs of Soviet citizens of African American decent and African Americans who resided or visited the USSR. Many African American intellectuals and activists supported the Soviet experiment because of the decreed Soviet ideology of internationalism and the practical achievements of the Soviet Union creating racial equality between 1920-1930s. Many African Americans traveled to the Soviet Union, spending months and even years there both as observers and contributors to the Soviet experiment. However, from the outset of the Soviet society, some African American intellectuals and activists had reservations about the Soviet promise and were skeptical of Communism's capacity to resolve the issue of racial inequality. The tradition of the Communist doctrine to privilege class over race and to reduce the issue of African Americans in the United States to class antagonism were viewed by many African Americans as an oversimplified abstraction. The Communists refused to acknowledge the complex interplay between class and race in the American context, which often made Communist policies on race issues in the United States divorced from the real experiences of African American communities. Besides, elements of racism, which still existed among the ranks of the American Communist Party circa 1920s also soured the attitude of African Americans towards Communism and the Soviet Union. In this context, it is understandable that many memoirs of Soviet citizens of African American decent and African Americans who resided in or visited the Soviet Union contain descriptions of the situation of Jews in the USSR. In comparison with the tiny community of people of African descent in the Soviet Union, the Soviet Jews constituted a large and visible ethnic minority. As the memoirs in question prove, the situation of Jews in the USSR was a critical junction for many African Americans interested in the Soviet experiment as a practical test of achievement or failure of Communist internationalism. African Americans identified and were in solidarity with the Soviet Jews as a large and oppressed ethnic minority of the former Tsarist Russia. And the fate of the Soviet Jews under the Soviets revealed the truth about the workings of the new system vis-à-vis the issue of race and creed. This project is based on writings of a diverse group of individuals, who range in terms of age, class, place of birth, occupations, political believes, and time of arrival and time spent in the USSR. Among them are writers Claude McKay and Langston Hughes, singer and activist Paul Robeson, Communist leader Harry Haywood, music historian Lily Golden, journalist Yelena Khanga, and tool-maker and engineer Robert Robinson. This diverse group of historical observers present a variety of accounts of the situation of the Soviet Jews. Some writers have positive views of Soviet achievements in the area of equality. Their writings evoke that the Jewish question in the Soviet Union was successfully resolved, and that it can provide a model for African American integration back home. The majority of the accounts, however, narrate about the continuing presence of anti-Semitism in Soviet society, notwithstanding the official decree and stemming from the tenants of the Communist ideology of internationalism and non-discrimination. This project reflects on the successes and failures of internationalism during the Soviet era and the feasibility of the Soviet promise vis-à-vis the issue of race and creed by focusing on the Soviet Jewish question as viewed through the eyes of African American subjectivity. This project presents a historical account of the Jewish experience in the USSR as written by Soviet citizens of African American decent and African Americans who resided in or visited the Soviet Union, revealing this history also as a narrative of solidarity.